You will receive an automated email after submitting your tour request, followed by a detailed confirmation email from the Tours Coordinators within 3 – 5 business days. If you do not receive this confirmation, please email tours@carnegielibrary.org to confirm that your group visit has been received. Note: Historical Tours are scheduled through Eventbrite, which will send an email confirmation once registered. Additional emails will not be sent from the Tours Coordinator for historical tours. To ensure adequate library space and staffing, group visits must be scheduled at least two weeks in advance. To maximize your group tour experience, we will only schedule one group visit per day within the same timeframe. Unannounced group visits may not be accommodated with a full tour. For groups whose members are in grades 6 and up: No more than 50 members per group visit with at least one chaperone for every 15 students. For groups whose members are in preschool-fifth grade: No more than 40 members per group visit with at least one chaperone for every 10 students. If you need to cancel the group visit for any reason, please notify the Library at least 24 hours in advance by emailing tours@carnegielibrary.org. In the event of a weather-related cancellation on the day of your visit, please call 412-622-3114 and provide your name, phone number, and name of the group visiting. To provide the best visitor experience possible CLP is pleased to offer your school or organization a group borrowing card. A group borrowing card will offer the opportunity for your group to check-out materials and access electronic resources that support your learning objectives while in the library for your visit. Library materials may be borrowed by everyone in the tour group with this single card and returned to any library in Allegheny County. Group Borrowing cards are good for 60 days. Re-activation for future visits may be requested as part of any future group tour requests. All group tour visitors within Allegheny County are eligible for a group borrowing card. The organization may select up to five individuals accompanying the tour to have access to the account. To ease the check-out process during your visit any listed individual may use a photo ID or badge in lieu of the card to borrow on the account. To obtain a group borrowing card, fill out and return the following application prior to your scheduled visit. Your card will be available for pickup at the First Floor Customer Services desk. Download the application here: Group Borrowing Card Application form. If your tour group members would like to obtain their own individual library cards, information to do so can be found here. If you have questions or would like more information on library card access, call 412-622-3118. For groups that will be visiting the Library during lunchtime, it is recommended that shelf-stable food items be packed (staff can store on carts). Additionally, the Crazy Mocha Coffee Company operates a coffee bar on the first floor of CLP – Main that serves sandwiches, desserts, and other treats. Food and drink can be enjoyed on the first floor of the Library, and lidded drinks are allowed on all three floors. Note: Group Lunch Space is limited within the library, but outdoor space near the building is available during warmer months. The Library and Museums operate a six-level parking facility for cars and small vans. The lot is located directly behind the Museum and can be accessed from the intersection of Forbes Avenue and South Craig Street. 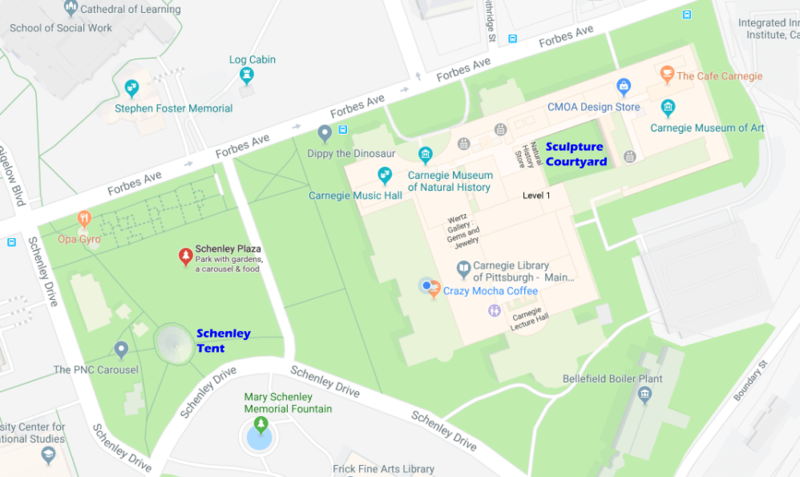 Buses can park on Schenley Drive, in the bus lanes next to Phipps Conservatory. For more information on how to get to Main Library, visit the Main Library Group Tour Information document.